We develop and constantly improve our electrocardiography devices, with accurate diagnostics and doctors’ convenience in mind. We ensure the most rational offer and guarantee a credible cooperation. How CARDIOTEST makes cardiologist’s work easier? When developing our medical equipment we, in «DX-Systems», always take on board the advice of working cardiologists to implement their needs in our devices. «CARDIOTEST» is easy and convenient to operate. It has a clear and logical inteface. It will not take you long to learn how to opearte the device. We know how much ECG rooms differ: by ownership, budget, key requirements and number of patients during the day. Who will be examined – children or adults? What is your clinic profile? You might be needing additional electrodes or cables. You need to decide, whether the device is going to be USB-powered or equipped with BlueTooth? 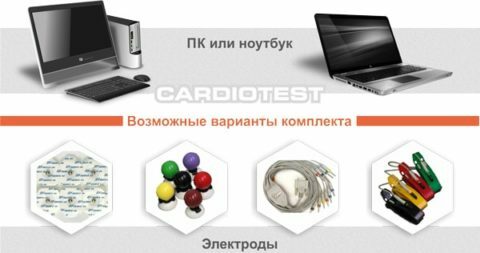 To make handling CARDIOTEST as convenient for you as possible DX-systems is offering you to choose the contents of the set so that it becomes tailored to your needs. 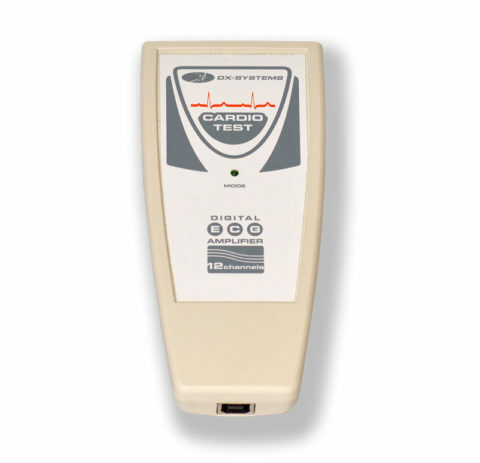 The «CARDIOTEST» series consists of modern compact devices that can be connected by the doctor, if needed. The text and color marks make the process even easier. Our account managers will ensure technical support – we explain how the device works and help you record first cardiograms. To address different needs DX-Systems developed several modifications of «CARDIOTEST»: Bluetooth ECG, USB ECG and Cardiac Stress Test ECG. If you decided on purchasing «CARDIOTEST» and still in doubt as to the modification, we will be happy to steer you in the right direction! 1 We will give you detailed advice, leaving no questions unanswered. 2 Our trained professionals will help you decide on the device set. 3 Request a return call using this form. We will call you back to answer any of your questions. 4 If you prefer text messages, contact us via Skype: dxsystems, or e-mail: dxmeddevice@gmail.com. «CARDIOTEST» registers a 12-lead, Nehb and Frank ECG. 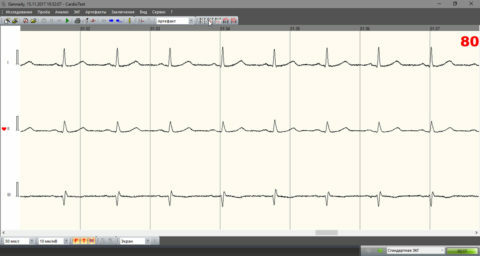 The software makes it possible to analyse ECG during registration and print out a selected fragment. Control commands is kept to a minimum. The software makes it possible to customise band speed, ECG amplification, graph paper background and lines colour. Such customisation makes it easier to perceive information. 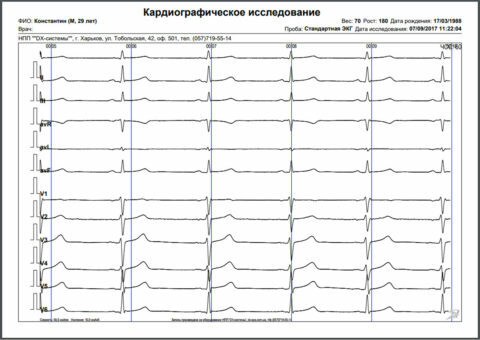 HR current valueand rhythmogram are displayed on the screenduring registration. It is possible to analyse the received complexes under the Magnifier mode. CARDIOTEST interactive ECG band enables a one-click jump to the fragment you needto study in more closely. Areas not suitable for analysis are evident: their background and signal color are different. 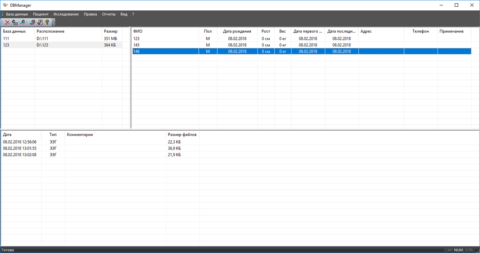 By customising the leads you make band analysis easier: you can reposition or disable any of the leads or change the order in which they are displayed. 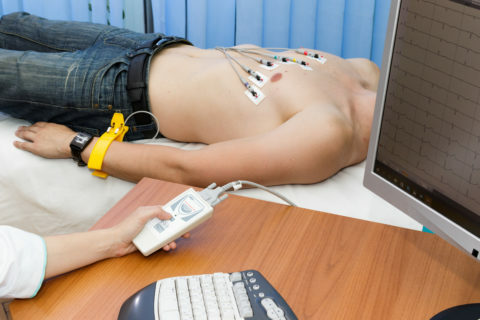 What tools does CARDIOTEST offer for ECG analysis? Contour analysis with automatic label placement. Amplitude and time parameters computation for any cardiocomplex. Building a value sheet for 12 leads. Assessing the position of QRS vector. Identifying and analysing a representative complex for all recorded leads. Automatic ECG Description simplifies conclusion building. The software automatically displays the parameters of the ECG that was registered, assesses the position of the QRS axis, computes the heart rate and cardiocomplexes components intervals. All that data is essential for ECG assessment. The Magnifier Window is designed for ECG Complex analysis by one lead. The system automatically singles out PQRS peaks and computes their amplitude-time characteristics. The automatically placed labels are easy to correct manually. A Complex may be displayed against graph paper or a white background with a timescale for visual assessment of the curve. The amplitude and length in any point pair will be measured by the Compass Tool. 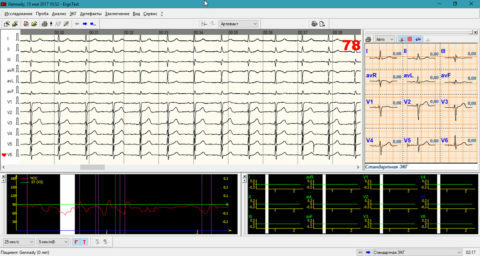 The mode displays the selected complex by all leads, the ECG-signal value sheet. 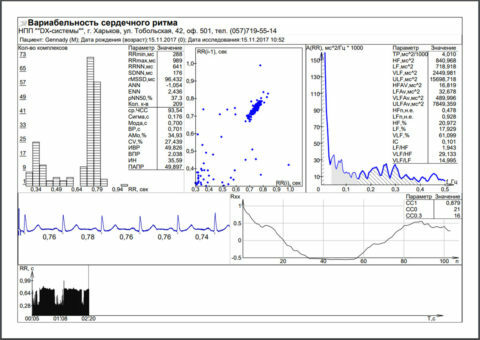 The software makes it possible to make cardiocomplex integral assessment. You can jump between the complexes in the window. The Complex Mode also displays ECG editable automatic description. When printed out the results look the same as they are displayed on the screen. The automatic labels can be edited under the Magnifier Mode. The software saves ECG with the analysis and patient data. It is up to you which fields you fill in onn patient electronic card. You can find the record you need by enetering patient name, date or other parameters. Within seconds you will find all patient cardiograms and follow the dynamics. Database files, just like individual entries, may be synchronised with the cloud, sent by e-mail or via your local network. forecasting progress of the disease. 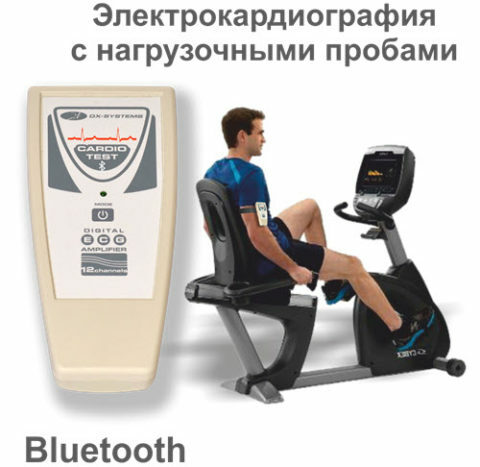 The examination is carried out on a cycle ergometer or a treadmill, where stress level and exercise duration are set. While recording, the software is computating ST (aSt) shift. The system produces an alarm signal and stops examination when HR and aSt threshold values are exceeded. 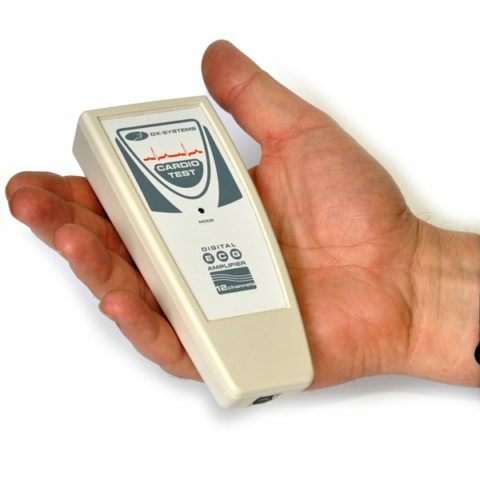 ERGOTEST makes it possible to assess the dependance of ECG on stress level. The system displays HR graphs, ST shift in the selected lead, stress level, blood pressure measurements and detected arrhythmias. For each of the complexes immediate parameter values are available. Before printing the results you can add your own comment by using an embedded text editor. When developing CardioTest, we paid close attention to database building. Patient data and recorded electrocardiograms are saved to the PC. Th software is equipped with special functions for handling an electronic card index of patients and voluminous archives, which you are going to accummulate over years of operating our cardiography device. We do all for doctor’s convenience. The software was developed with regard to the comments of working cardiologists. 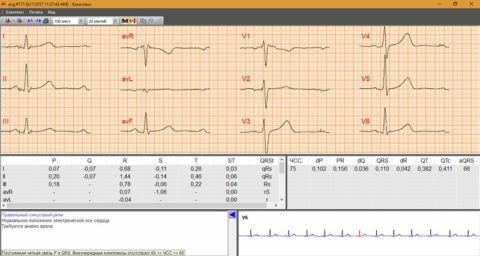 We made the interface comprehesible for a professional with any level of experience, having envisaged ECG expanded analysis and included customisation. 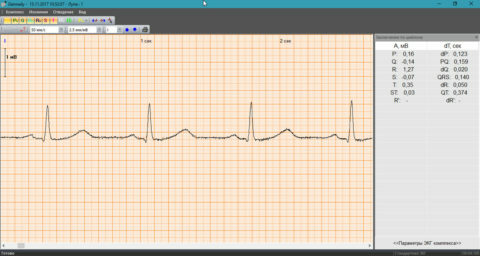 Try demo version and see for yourself how handy and easy to handle our electrocardiography device is. We are sure CARDIOTEST software is fast and easy to handle. For you to see how handy and easy to handle it is we have opened access to its demo verion. 1Leave you email address where we will send you a link. 2After you have clicked "Receive Access" you will get a message within an hour. 3Download the software and follow the step-by-step guide. 1. We give you detailed advice on the phone and on site. 2. We ensure the timely supply of expendable materials. 3. We carry out maintenance works. 4. We ensure you with free software updates. 1. We do our best to effectively address your issues remotely, on the phone, via Skype or TeamViewer. 2. If remote assisstance does not work, we send out a technician to help you. 3. We provide you with a substitute while servicing your device. In 18 years we have installed hundreds of devices and taught our customers to handle them. We are doing continuous research to improve our electrocardiography devices. 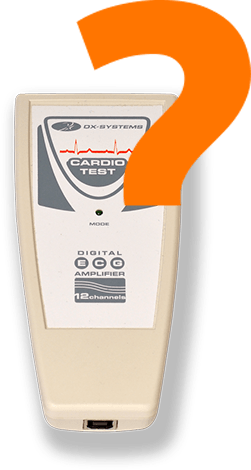 Considerable personal discount is envisaged for those who have already been using CARDIOTEST and decided to buy a new generation Cardiotest device. The same conditions are envisaged for our new customers right after they have purchased our device. Before buying medical equipment one can spend hours surfing the net for descriptions, comparing device characteristics, seeking manufacturer’s advice and still remain in doubt. Why? Because it is always better to learn how the device works by actually operating it. Use CARDIOTEST for 15 days for free, including zero charge for delivery, installment and professional advice. 1Fill in the form and we will contact you to clarify the details. 2We will deliver and install the device at any time that suits you best. 3our techician will install the device and help you record an ECG. 4From then on you can use CARDIOTEST for 15 days that will follow. 5If you decide to purchase CARDIOTEST, we will provide you with a new device. If not, we will be grateful for your feedback. We will cal you to confirm the order. Leave your digits and we will call you back in an hour to clarify delivery address and time. 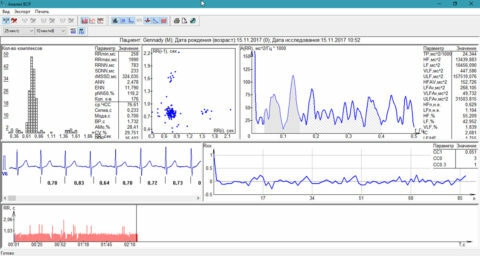 Feedback as to the computer electrocardiography device with cycle ergometry, produced by NVP “DX-Systems”. 295 patients with various locomotor pathologies have been examined so far. The examinations were targeted at finding out the level of physical working capacity, prosthetics options and the effectiveness of physical rehabilitation. The system is equipped with a convenient interface and a wide range of parameters, ensures sufficient responsiveness and is reliable in terms of results representation. It is also handy to use. 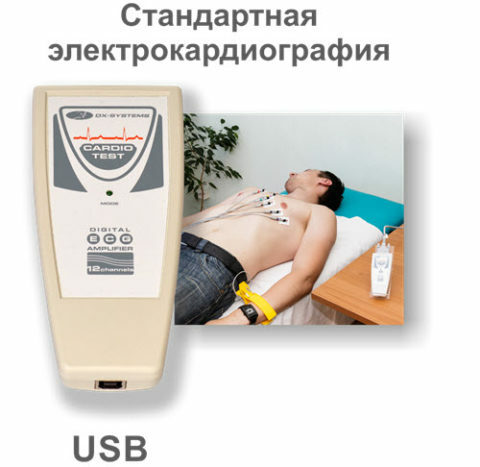 Cardiotest was installed in the polyclinic of Kharkiv Municipal Clinical Hospital in October 2011. Previously we used Decard software. 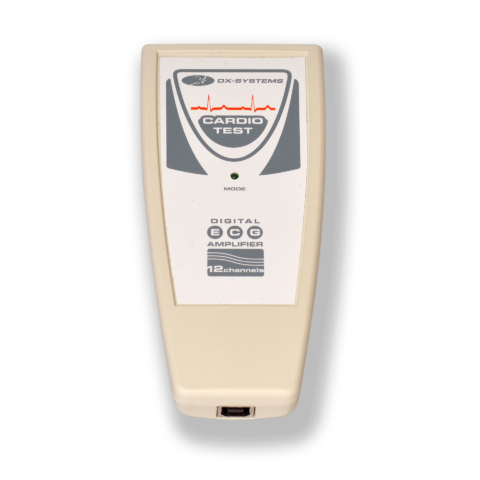 With Cardiotest we have been using the VEM mode for dosed stress testing , that is the monitoring of cardiac activity during the VEM test with further analysis and result assessment. The complex is placed in the functional diagnostics room of the diagnostics department. The examinations have been run by doctor Pinihina, M.D. Board Certified, and cardiologist Kovalska. We also examined those who were undergoing a periodic health examination . The device shows good quality of graphics and of representation of the results by 12 ECG leads. The user can customize montage, scale and recording speed. 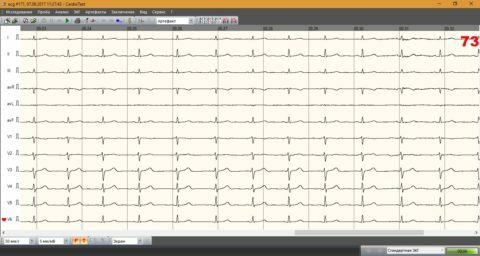 Signal filtering works on a good level, which makes it possible to get a recording with minimum artefacts to be able to assess repolarization as accurately as possible. There is a handy option of rhythm variability assessment, an EEG graph on the desktop panel and an option to help single out premature ventricular contraction. With CARDIOTEST when we now run a CEM test we have a better chance of achieving submaximal physical load with more accuracy and assuredness. 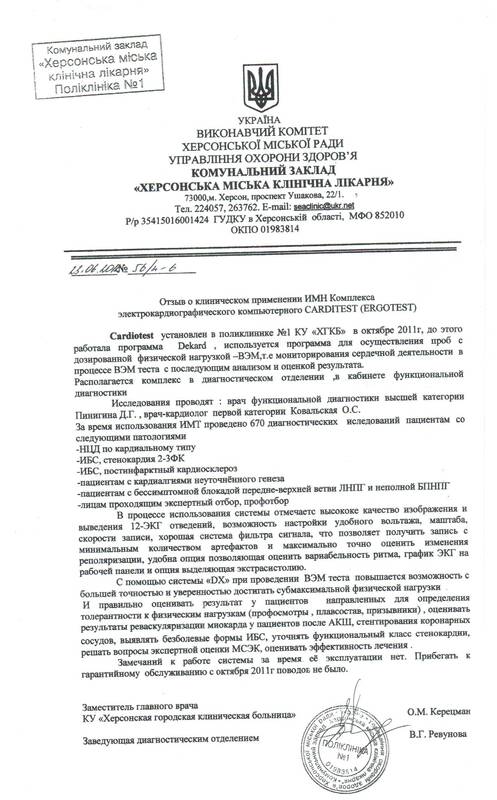 We are now able to give an adequate result assessment with patients directed to us for exercise tolerance tests (periodic health examinations, seafaring personnel and army conscripts), evaluate the results of myocardial revasculization in patients after CABG, coronary vessels stenting, diagnose angina sine dolore, precise angina functional class, address the issues of Disability Determination Services expert judgement and assess treatment effectiveness. We have had no criticisms as to the way CARDIOTEST functions so far. We have not turned to the manufacturer for warranty support since October 2011. 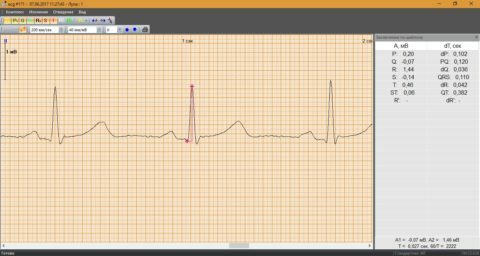 Feedback as to CARDIOTEST Electrocardiography Complex clinical use. Device 0960408 produced by NVP DX-Systems was placed into service on 30 May 2008 and is still being used by the functional diagnostics room of outpatient department No 1 of Primary Healthcare Centre No 12 in Donetsk. CARDIOTEST makes it possible to assess waves and do ECG monitoring to detect rhythm disturbances, myocardial infarction, early acute coronary syndrome and life-threatening arrythmias. About 28 000 examinations have been carrioed out over the period of device use. The Complex functions during both work shifts of the functional diagnostics room. It is intended for ECG examinations. It works by registering bioelectric potentials of heart from standard leads with their amplification, digitalisation and transfer to computer to be processed, stored and analyzed. The System makes it possible to manage a structured database by patients, which contains patient cards, recorded signals, their determined parameters and textual findings. We use physical load tests, drug stimulation exercises, Nehb’s and Slopak’s leads. A. Zajarnyi – general physician. CARDIOTEST has proved to be reliable, safe and with higher quality results compared to what we had before. We have not turned to the manufacturer for warranty support. 1Leave your digits and we will contact you to give you device details, tell you about its performance and explain purchase conditions. ASAPIn an hourTomorrow - When do we call you? 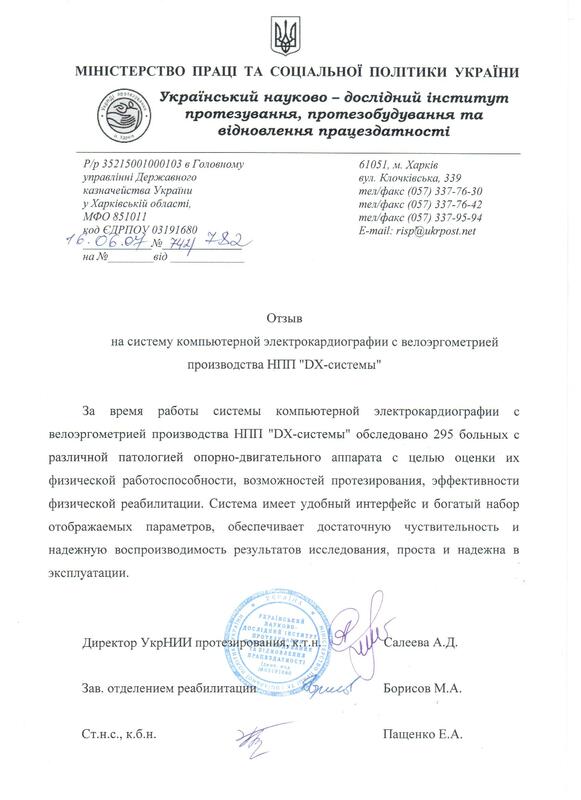 maintenance of medical devices for functional diagnostics.